A story of a mature Broadway producer and the similarities between his own relationship with his young secretary and the relationships in his Broadway play. 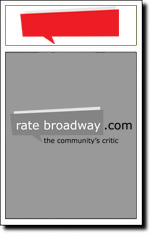 Accent on Youth is a difficult Broadway show to review. We went to see it mainly because of David Hyde Pierce - he's the actor who plays Niles Crane on the TV show "Frasier". That's all we knew before arriving at the theater. The play tells the story of a playwright who writes a play about an older man who becomes romantically engaged with a younger woman. The characters in Accent on youth find themselves in a similar situation to the play written by the playwright. The show is funny, but it's never really hysterically funny - it's humor is more subtle. The play isn't really a tragedy either, although there are definitely some sad parts. It made you appreciate your youth. Overall, I thought the play was entertaining - I wasn't sorry I went. ...but at the same time, it wasn't wonderful, either. It was a pretty average play. Not a bad play overall, but not great either. Was nice to see Niles from Frasier and Jim Dial from Murphy Brown on stage. Good acting. Good story. Nothing spectacular though. A "classical" play that has some good lines and a decent story. Felt a little old-fashioned.